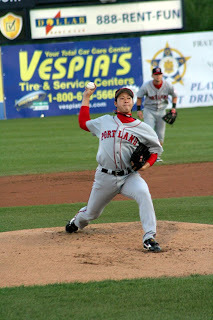 RHP Junichi Tazawa (6-3) worked a season-high 7 IP and C Mark Wagner drove in two runs as Portland (25-26) ended a 2-game losing streak at Hadlock Field, beating the Binghamton Mets (22-27) 3-2 on Tuesday night in just 2 hours and 39 minutes. RHP T.J. Large recorded his 4th save of the season by striking out 3B Jake Eigsti to end the game with the tying run at second base. Tazawa and Binghamton starter RHP Tobi Stoner (1-2) each hurled four perfect frames before the Mets scored the games first run in the top of the fifth inning on a lead-off homer by LF Lucas Duda. Stoner, who suffered the loss, yielded 5 hitless innings (one walk) but surrendered a 3-spot in the sixth inning. SS Argenis Diaz led off the frame with a walk, RF Reid Engel singled and both advanced 90 feet on a sac-bunt by 2B Ryan Khoury. Wagner gave Portland the lead for good with a 2-run double down the left-field line. After 3B Jorge Jimenez flied out, LF Aaron Bates (2-for-4) smacked a run-scoring double to straight away center field, proving to the be the game-winning RBI. Binghamton scored their final run of the night in the seventh inning on a sacrifice fly by DH D.J. Wabick. Tazawa yielded five hits, two runs, no walks and fanned three. RHP Richie Lentz worked around a lead-off walk in the eighth inning to earn his 3rd hold of the season. Lentz fanned two and hit 95 mph on the Hadlock Field radar gun. The Sea Dogs send RHP Ryne Lawson to the hill on Wednesday night against Binghamton RHP Ryan Coultas in a 6:00 PM start at Hadlock Field. Catch all the action on the U.S. Cellular Sea Dogs Radio Network beginning at 5:35 PM with the CorrectDeck Pre-Game Show. Notes: Bates picked up his 5th multi-hit game in his last six starts. Diaz extended his hitting streak to eight straight but Khoury had his hit streak snapped at nine. Tazawa improved his organization leading strikeout total to 57. Engel returned to the lineup and went 1-for-2, BB and a run scored. LHP Roydrick Merritt worked 1.1 scoreless frames for the B-Mets.